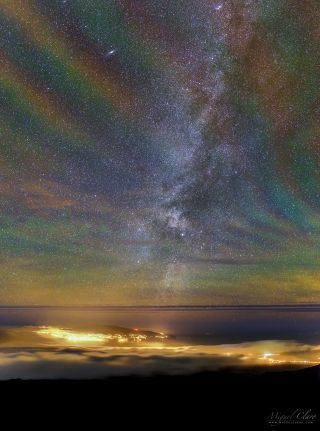 Above the low clouds on Pico Mountain, skywatcher Miguel Claro captured this incredible ‘rainbow airglow’ in March 2016 from Pico Island, Azores. An incredible "rainbow airglow" lights up the night over Pico Island in the Azores in this simply spectacular view from a veteran night sky photographer. Astrophotographer Miguel Claro took the image earlier this year in March from the mountain in Pico Island, part of the Azores group of islands near the coast of Portugal during a photo expedition with colleagues. "I stopped at about 1,200 meters to appreciate the views and photograph the lights coming from the island of Faial in the middle of the Atlantic Ocean, in a rare occasion with only a few clouds and part of the 'winter' Milky Way visible as a background of a temporarily clear sky," he wrote in an email to Space.com. The rainbow-colored bands of light or airglow is present in the atmosphere all the time but difficult to see. It takes the disturbance of an approaching storm to make them more visible by causing rippling in the Earth's atmosphere. The multiple colors are likely caused by sodium, oxygen and OH molecules in the air. And, our perspective from Earth makes it appear as if they are emerging from the mountain itself. The image also shows a spectacular Milky Way and Andromeda Galaxy shining above the island. To see more amazing astrophotography photos by our readers, check out our night sky photo archive here.